The winner of the architectural competition for the construction of the planned residential area in the GRAND CENTRAL project at Frankfurt’s main station comes from the Netherlands: The Delft office Mecanoo Architecten convinced in the jury meeting of the eight-member jury and secured the first place in a high-profile competition on November 30, 2018, in which renowned architects’ offices participated. The prize was awarded by Grand Central Frankfurt GmbH, a joint venture of the two property developers PHOENIX Real Estate and Groß & Partner, which are developing the property in close cooperation with the City of Frankfurt. The architectural competition was devoted to the design of a mixed-use district between Hafenstrasse and Adam-Riese-Strasse, which is within walking distance of Frankfurt’s main train station and in which a total of approx. 55,000 square meters (180,000 square feet) of new living space is being built. Up to 600 apartments are planned here, which are spread over a 140 meter (459 feet) tall residential tower and an adjacent building (which may reach a height of up to 60 meters; or 197 feet). An approximately 1,300 square meters (4,264 square feet) day care center and 1,700 square meters (5,576 square feet) of commercial space for local supply and catering complete the district mix and create a new, attractive, urban location. The proportion of subsidized living space amounts to a total of approximately 16,500 square meters (54,120 square feet) of living space, divided in half between the funding programs 1. Förderweg and 2. Förderweg. For the residents and visitors of the quarter are about 400 parking spaces available. In addition to Mecanoo, the Frankfurt-based architects Mäckler, HPP, Ferdinand Heide and NKBAK took part in the competition, as did the Berlin-based office Eike Becker and the Danish architect Schmidt Hammer Lassen from Copenhagen. The jury, which consisted of representatives of the City of Frankfurt, architecture and urban development experts and the initiator, were able to evaluate seven designs and awarded four prizes due to the high quality of the proposals. The winner of the competition was Mecanoo. The Frankfurt team of Mäckler Architekten took second place just behind, the third place was awarded twice – to the architecture firms Ferdinand Heide and HPP. All designs must, however, be revised due to the complex development of the district and the building dependencies. “The concept of Mecanoo convinced us that the challenges of this district planning were solved with a very attractive, sustainable and at the same time intelligent architectural concept. The exposed location at the main station and the high visibility of the residential tower demand an outstanding façade design, which we at Mecanoo rated very positively “, commented the representative of the representative Jürgen Gross and Dr. med. Frank Lebsanft together the winning design. The City of Frankfurt was also satisfied with the result of the competition: “We welcome the fact that considerable new housing is being created in this central location, of which 30% will be subsidized apartments. With this project of internal development, brownfields are meaningfully used without additional surface sealing. The neighborhood will continue to open up to the neighborhood in the future. The new day-care center, restaurants and shopping facilities on the ground floor of the two buildings are also contributing to the revival, “commented Frankfurt’s planning department head Mike Josef on the decision of the jury. The newly developing residential complex is part of the larger GRAND CENTRAL project development on the northwest side of Frankfurt’s central station. On the area between Adam-Riese-Straße and Hafenstraße stood vacant posthalls that were demolished in the course of the year 2018 in order to realize new uses on the approximately 130,000 square meters (426,000 square feet) area. Deutsche Bahn AG, the German railway operator, kicked off the conversion of this urban area by leasing the new corporate headquarters for DB Netz AG, which will be constructed by the end of 2020. In addition to apartments, offices and a hotel, gastronomic areas are planned on the premises. A pedestrian bridge over the Hafenstraße should connect the quarter directly to the main station. 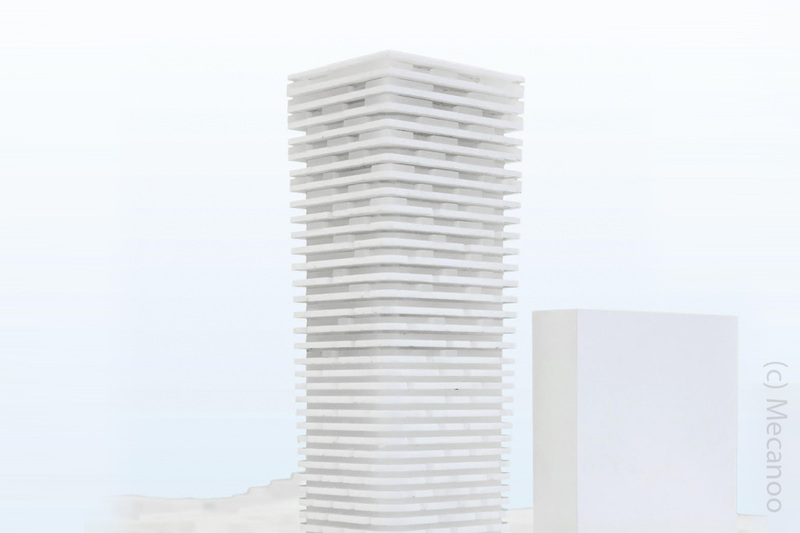 The realization of the new residential district, including the 140 meters (459 feet) tall residential tower, is to begin at the earliest after the completion of the corporate headquarters for DB Netze AG in late 2020 / early 2021.